As one of the most successful centres of business in Europe, Dusseldorf, the state capital of North Rhine Westphalia (NRW), is an important hub for numerous listed companies in Germany and internationally. In particular, companies operating in the industrial, chemicals, telecoms and high-tech sector as well as in the banking and insurance sectors are located in NRW. Furthermore, a large number of renowned international companies have their head offices for the German and European market in Dusseldorf. In order to be able to advise our clients locally, we opened our office in Dusseldorf in 2017. 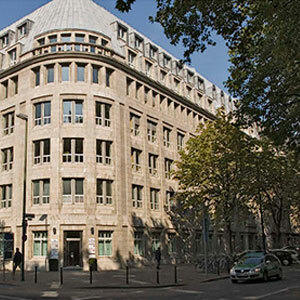 One of the areas on which our lawyers in Dusseldorf focus is real estate law. Our comprehensive expertise comprises all questions on commercial property, both for sellers and investors. Furthermore, we have particular expertise in company law, especially with regard to legal issues in the areas of corporate law as well as M&A and commercial law. Our full-service advice continues to comprise litigation and conducting arbitration proceedings. By fully integrating the Dusseldorf office, we are able to offer our clients professional and tailor-made legal advice on a local basis in cooperation with our 66 offices worldwide. Coming from the south on the A3, when you reach Autobahnkreuz Hilden, please take the exit for the A 46 towards Dusseldorf. Then take the exit Dusseldorf-Bilk to leave the motorway and head towards the city centre. At the end of that expressway, please turn right onto Südring. After approx. 100 metres at the fork, Südring becomes Merowinger Straße. Continue straight on Merowinger Straße until it becomes Friedrichstraße and then Breite Straße. When you reach Benrather Straße, please turn right onto Königsallee. You can park directly in front of our office or in one of the surrounding parking garages. From Dusseldorf main station (Hauptbahnhof), please use any underground train (U-Bahn) towards Heinrich-Heine-Allee until you reach "Sternstraße/Königsallee" after approx. 3 minutes. Our office is located on the western side (banks side) of Königsallee. Coming from Dusseldorf Airport, there are both Deutsche Bahn and VRR (Rhein-Ruhr transport association) train connections available which will take you from the airport train station to Dusseldorf main station (Hauptbahnhof). To arrive at the airport train station, please use the Sky Train which departs from the upper floor of the main hall. From Dusseldorf main station, please use any underground train (U-Bahn) towards Heinrich-Heine-Allee until you reach "Sternstraße/Königsallee" after approx. 3 minutes.